Aerial view of the fish farm and diesel fuel spill. Emergency crews are responding to a diesel spill at a fish farm near the northern tip of Vancouver Island. Larry Skookum John arrested by RCMP for opposing Cermaq fish farm, August 23, 2016. 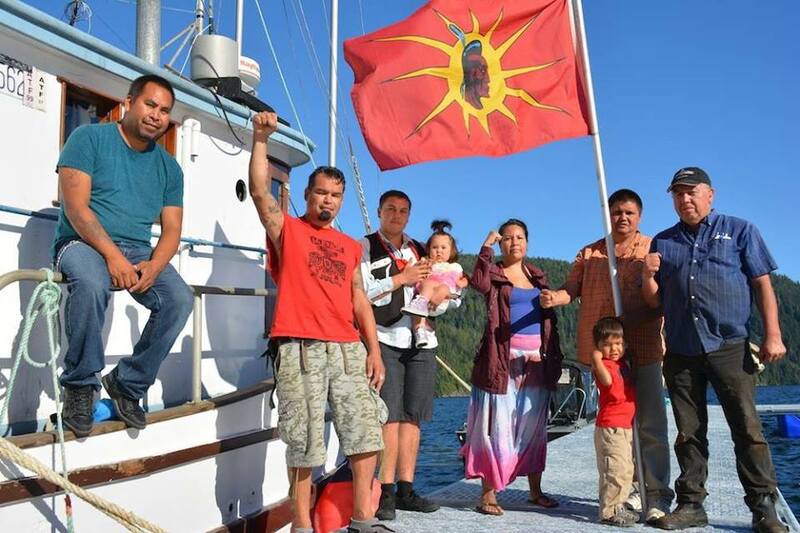 Musgamagw Dzawada’enuxw hereditary chiefs board Cermaq fish farm near Kingcome Inlet to serve eviction notices. 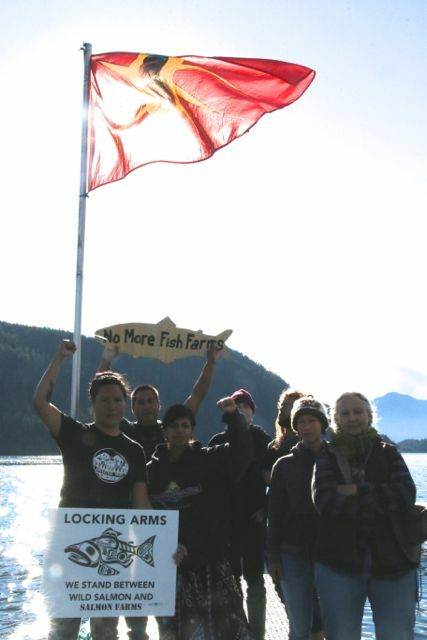 Warriors for Yaakswiis during blockade of fish farm near Ahousaht, Sept 2015. Today at 6 am, the Yaakswiis Warriors and their supporters went to witness the removal of the Cermaq fish farm pens from the Yaakswiis site in anticipation of the fulfillment of a verbal agreement made between Lennie John and James Costello of Cermaq would, “at first light,” bring out a barge and tugboat and remove the pens & anchors. After first light came and went, the Yaakswiis Warriors tried numerous times to contact the Chief and Council as well as Cermaq to inquire as to what the hold up was on the arrival of the barge and crew. Chief and Council as well as Cermaq did not answer the calls, no contact was made. A small group of fish farm protesters calling themselves Ahousaht Muuschim and supporters accepted an invitation to meet with Ahousaht leadership and other band members at the Thunderbird Hall Sept. 14. Tyee Ha’wilth (head chief) Lewis Maquinna George extended the invitation after protesters blocked the installation of Cermaq’s salmon farm just north of Ahousaht.